Northern Illinois senior DeMarcus Grady (Grand Rapids, Mich./East Grand Rapids) has rejoined the Huskie men’s basketball team following the conclusion of the football season. 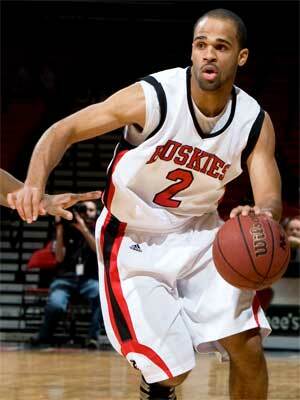 Grady, a five-year member of the NIU football program, is joining the basketball team for the second consecutive season. Grady played in all 14 games for the Huskie football team this season, seeing time as a receiver as well as on special teams. He had two catches for 51 yards and also recorded a tackle. Last season, Grady joined the NIU basketball team following the Humanitarian Bowl, seeing his first action on Dec. 27, 2010 at Missouri. He appeared in 15 games, making two starts, while averaging 3.5 points and 1.7 rebounds per contest. Grady was a four-year basketball starter at East Grand Rapids High School, earning all-state honorable mention honors during his senior year. The Huskies take on Central Michigan at 3:30 p.m. Saturday, Jan. 14, inside the Convocation Center. For more information on NIU men’s basketball and Huskie athletics, visit www.niuhuskies.com.